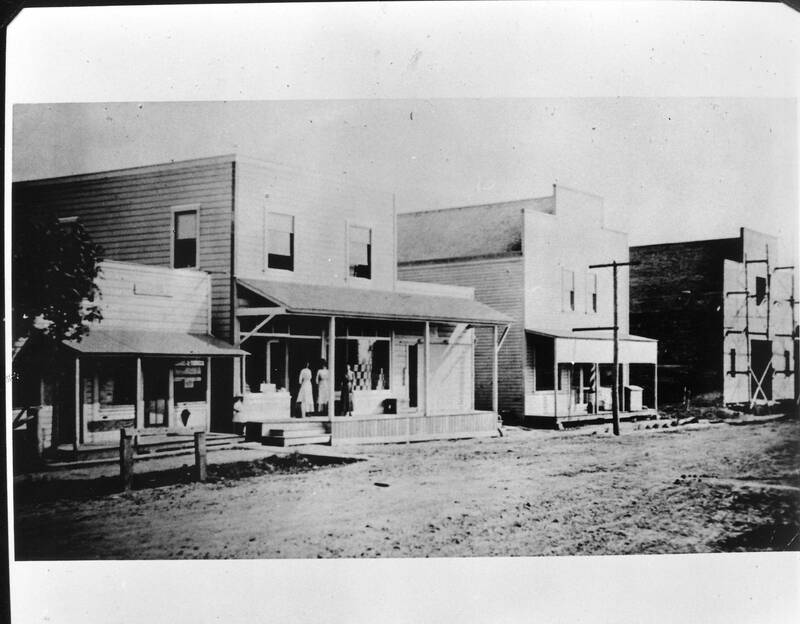 A black and white photograph of Main Street in Tigard shows four wood buildings lining a dirt road. In front of the first building on the left is a wood hitching post. Three women stand on the porch of the second building from the left. A telephone or telegraph pole appears in front of the third building to the left. Construction scaffolding exists on the facade of the building to the far right. Prior to 1911, Tigard's commercial activity was located around the Tigardville General Store at present-day Pacific Highway South and McDonald Street. When the Oregon Electric Railroad began service to Tigard in 1907, the local depot was established 1.5 miles north of Pacific Highway and McDonald Street. Subsequent commercial development shifted to this area (present-day Main Street) near the rail stop.